Episcopul Longhin este un preot ortodox roman din Ucraina. Parintele este staret al unei manastiri intemeiata de el insusi, Manastirea Banceni, aflata in Ținutul Herța. Localitatea Banceni a facut parte până nu demult, din Principatul Moldovei. Episcopul Longhin, sau Parintele Mihail Jar, creste peste 400 de copii, si nu doar …atât! Acest reportaj este un portret al unui mare crestin si roman. 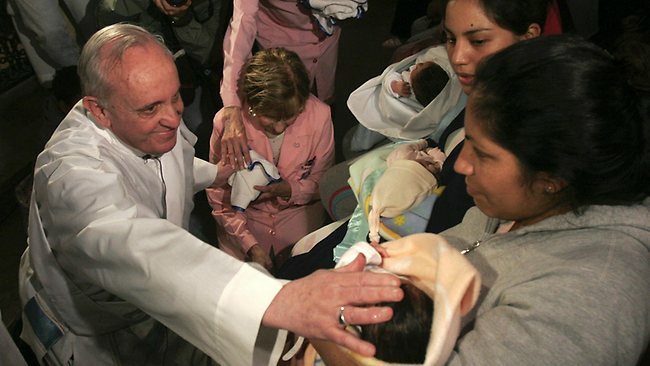 First, the World Notices a Faith that Cares for the Poor. Second, the World Recognizes Humility. VATICAN CITY, Dec 12 (Reuters) – Pope Francis said in the first peace message of his pontificate that huge salaries and bonuses are symptoms of an economy based on greed and inequality and called again for nations to narrow the wealth gap. In his message for the Roman Catholic Church’s World Day of Peace, marked around the world on Jan. 1, he also called for sharing of wealth and for nations to shrink the gap between rich and poor, more of whom are getting only “crumbs”. Maica Tereza de Calcutta (Agnes Gonxha Bojaxhiu) s-a nascut acum 100 de ani la Skopje, Macedonia. Cititi AICI o scurta prezentare a vietii ei pe blogul Proiectului Sf. Nicolae. M o s c o w — A sense of unity and love between the Protestant believers of Kyrgyzstan was the overriding impression made on a Russian, three-man/woman reporter team during its three-day visit to that strife-torn country. “The true God unites;” the Protestants concluded. After their return to Moscow on 27 June, they reported: Despite all the destruction the citizens of southern Kyrgyzstan are presently forced to endure, “the primary gift that God has presented to his children in this situation is love.” Though the Baptist Union of Kyrgyzstan does not belong to international Baptist agencies such as the “Baptist World Alliance” (BWA), it naturally expressed great gratitude for the monetary gifts brought by the team of reporters. Their gift included funds from the BWA and European Baptist Federation as well as from the Baptist Unions of Germany and Russia. M o s c o w / K o b r i n – No government or Orthodox dignitaries were present on 26 June – but 52 guests from Missouri/USA were – as hundreds of Kobrin Baptists celebrated the opening of Belarus’ first privately-run home for the aged. Most of the costs for the magnificent “Baptist House of Mercy” with one- and two-bed rooms for 54 residents were footed by them – supporters of a network of Baptist retirement homes in Missouri. Amazingly, the reconstructed and enlarged building on the grounds of the Baptist-owned “Zhemchuzhinka” (Little Pearl) children’s camp at Imenin just north of Kobrin cost no more than $500.000 US – excluding material gifts mostly from West European sources.